Former California Gov. Jerry Brown joined Gov. 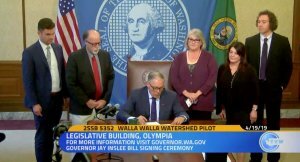 Jay Inslee and Washington legislators today to talk about climate change and the package of clean-energy legislation and investments Inslee announced last month. Following a meeting with House and Senate Democratic leadership, Brown and Inslee made statements and took questions from reporters. 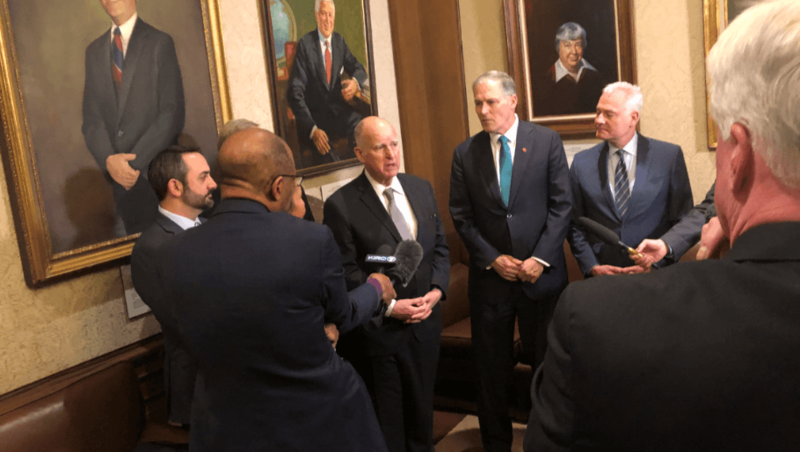 Brown credited the passage of a cap-and-trade bill to buy-in from several Republicans in the California Legislature; Inslee expressed both a confidence rooted in a strong democratic majority, and an openness to Republican legislators’ input. Earlier in the day, the Senate Environment, Energy & Technology Committee heard public testimony on a bill the governor requested (SB5116) that would begin Washington’s transition to 100 percent clean energy by 2045. 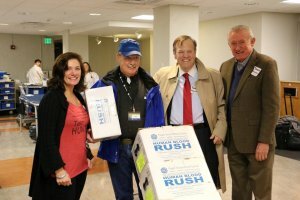 In the hearing — which required overflow seating in another Senate hearing room — Committee Chair Sen. Reuven Carlyle said he’s aiming to have a substitute bill introduced by next Tuesday, January 22.